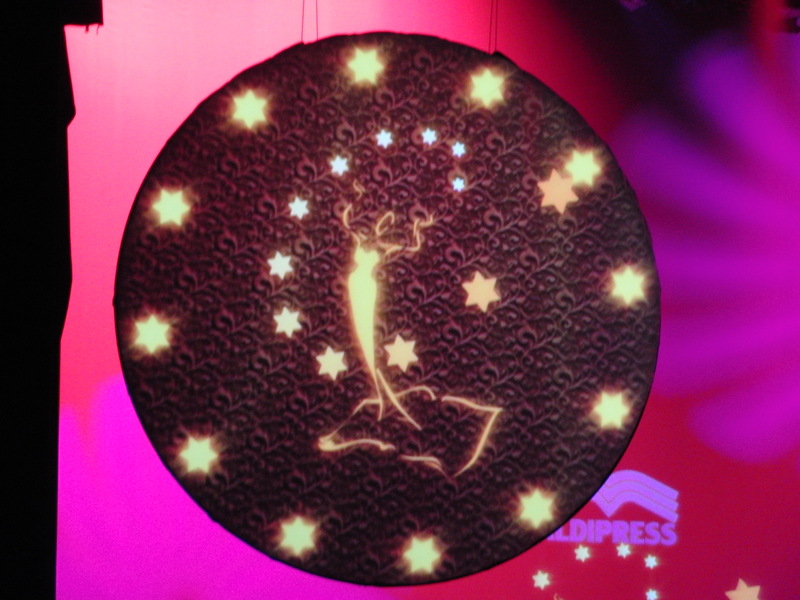 Wishing each and everyone Happy Holidays, Merry Christmas, a Very Happy New Year and a Great New Decade. Mr. Magazine™ and the team. The blog will resume next week. When Rudyard Kipling wrote “OH, East is East, and West is West, and never the twain shall meet,” he either did not visit or heard of Lebanon. The capital of Lebanon, my birth country, the city of Beirut used to be referred to as the Paris of the Middle East. Today, it can easily be referred to as the Paris and New York of the Middle East. English, French and Arabic are the every day languages of all the majority of the people in Lebanon. A quick look at the country’s newsstands and one will be amazed by the number of titles in all the aforementioned languages. On my fourth day of the Ten-Day-Around-the-Magazine-World tour I landed in Beirut and headed 50 miles north to my birth town Tripoli, the second largest city in Lebanon. My first magazine activity was to speak at a new magazine launch party called Abjad (which translated from Arabic is the first four letters of the alphabet and is also short for the alphabets). The magazine is the brain child of veteran Lebanese journalist Bassem Bakkour. Abjad is a new magazine aimed at high school students and refers to itself as “an encyclopedia in a magazine.” The magazine combines history and science fiction, science and space, geography and lifestyle. 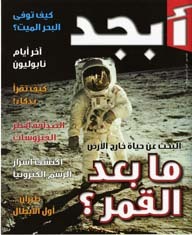 The magazine is mainly in Arabic but have sections in English and French. Bassem’s vision for the magazine is to fill a void in the Lebanese market place where, although there are hundred of magazines published, none is aimed at this audience, the 13 to 18 year olds. Bassem’s goad is to get the magazine distributed in all high schools in Lebanon. The magazine launch party at the See and Sea restaurant overlooking the Mediterranean sea, marked a dual celebration for me. The first, the celebration of the launch of a new magazine, and the second, the fact that this is my first-ever speech I give in my birth country since I left Lebanon 31 years ago. The launch of Abjad is a great example of how new magazines can be initiators rather than reflectors of society. The majority of magazines usually are reflectors of what goes on in our society. Only few magazines, the ground breakers, are more initiators of things to help educate, entertain and inform their readers. Abjad is such a magazine. The same day when the celebration of the launch of the new magazine was taking place, another journalistic event was taking place in Lebanon. The fourth anniversary of the assassination of Gebran Tueni, the director general of An-Nahar one of the leading independent newspapers in Lebanon. Tueni, who was also a member of the Lebanese parlement, was assassinated on Dec. 12, 2005. Tueni’s family and the An-Nahar newspaper established The Gebran Tueni International Freedom of the Press Award that is giving annually to a journalist who is instrumental in his or her defense of the freedom of the press. This year’s recipient was Asos Hardi the director of Awene, a publishing and distribution firm in Iraq. 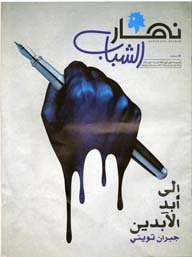 An emotionally and intellectually executed special issue of the weekly supplement that Gebran Tueni established was distributed on the day of the event. Nahar Ash-Shabab issue number 578 is a keeper for me. The next day I went on my magazine tour of the newsstands. To say I was surprised by the number of new magazines will be an understatement. I found new magazines in Arabic, in English and in French. SoChic is a hefty 242 pages of fashion, elegance and beauty published by one of Lebanon’s best known women’s magazine Al-Hasnaa. The Arabic language magazine is a who’s who guide to some of the top fashion designers of Lebanon and the Middle East. Gala, the German import, is now being published monthly in Arabic from Beirut. The content of the magazine has been totally adapted to the Lebanese market with some infusion of the international world of celebrities. The third new magazine published is Fatafeat and is published in two separate editions: English and Arabic. 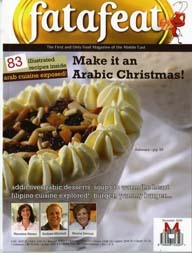 The magazine is “the first and only food magazine of the Middle East,” published from Dubai and distributed through the Arab world. Fatafeat is a brand expansion of the Fatafeat Cable Channel that will celebrate its third anniversary on Dec. 26. 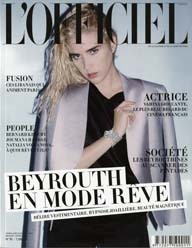 Another European import to Lebanon is the first issue of L’Officiel Levant, the Lebanese edition of the French leading fashion magazine by the same name. The first bimonthly issue also has a hefty 242 pages and is well designed and packaged. The remaining three new magazines that I have added to my collection were all in English. 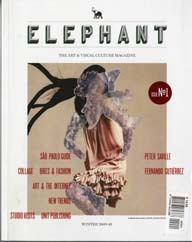 In magazine is the latest entry into the field of fashion and inspiration. The magazine promises to be a “source for trendy women and curious men and if you like vice versa.” Daring is the adjective that comes to mind to describe this magazine and its cover. The second new English language magazine is Eleganté, the “way to luxury and lifestyle.” The magazine combines lifestyle articles such as “If you think of cheating on your man, think again! !” to “Outrageous Hotels for the Mega Rich.” Last but not least is Absolute Beirut the magazine devoted to the “experience and entertainment” around the capital city of Lebanon: Beirut. Absolute Beirut can easily be a copy cat of Gotham magazine or Ocean Drive magazine. A lot of society and party scene pages scattered between all the luxury info-tainment. As I stroll the streets of Tripoli carrying my loot of new magazines, a sly smile appears on my face as the funny thought of the prophets of doom and gloom that print is dead and the future is for something else. It is yet time again for some of those prophets to leave their cocoons and tour the world. An active and healthy magazine market still rules in a lot of places. All what you have to do is reach out and smell the magazines…they are out there. Next on the tour, a Lebanese magazine called Jasad (Body) that is causing quite a stir in Lebanon and the Arab world and two futuristic newspapers in a world filled with traditional newspapers. To read part one of my ten days tour click here. To read part two of my ten days tour click here. And for those of you who speak French as bad as I do, the above title means “In Paris It Is Said Magazines are Living…” Growing up in Lebanon it is assumed by many who meet me that I should be able to converse in French, but alas, I was one of the few who went to an American school in Tripoli, Lebanon and thus my French is 100% dependent on my wife’s knowledge of that language (She went to a French speaking school). So, to give credit where credit is due, the help with the translations of the names of the magazines come from my wife. Well, back to my travels and the story at hand. C’est dit! 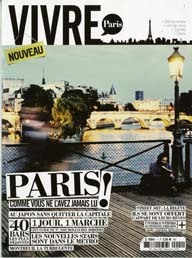 and Vivre Paris are the names of two of six new magazines that welcomed me at the Charles De Gaulle’s Airport upon arriving in Paris on my third day of the Ten-day-around-the-magazine-world trip. The newsstands were crowded, and I mean crowded with magazines lining the shelves in every square centimeter of the store. The first thing that attracted my attention was the availability of some magazines in more than one format. I have heard and seen the practice of the so called pocket size publication sprouting all over Europe since the launch of the pocket size Glamour magazine in the United Kingdom. All across the continent magazines are now testing the pocket size along with the standard size. Some selling for the same price while others discounting the smaller size. The key problem is of course for the retailers who are not willing to give the magazine double display due to the crowded shelves. One solution I saw in Amsterdam is the placement of the pocket sized magazine in front of the standard size, thus sharing the same space, and probably cutting the draw of the standard size magazine. The one magazine that grabbed my attention was the German import Gala. The French Gala came in three different editions: the standard magazine with a 2.20 euros cover price, the pocket size magazine with a 1.80 euros cover price (which by the way is nothing but a proportional reduction of the standard size making everything smaller including the type, unlike the specifically pocket-size designed British Glamour), and a standard sized magazine with a cover mount of four Christmas cards and envelop designed by Jean-Paul Gaultier, Gucci, Sonia Rykeil and Christian Lacroix. The magazine and the cards costs 4.95 euros. Well, I bought all three identical magazines all sporting the new Miss France on the cover Malika Ménard. It is amazing that with the increase of the number of new magazines arriving on the market place, that some magazines want to create clones and then demand double the space on the retail floor for the same magazine. Will it work, and at what cost, is going to be the six million dollar (or euro) question. My visit to the newsstands was really fruitful. I ended up with six new magazines ranging for those aimed at teens to the extremely well done Paris Living magazine. My first new magazine was TCHiK. A pocket sized publication that reminded me so much of Life & Style Weekly magazine combining celebrities, fashion and beauty. 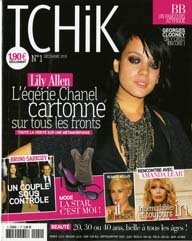 The name of the magazine seems to be a play on the word Chic, with a heavy TCHik French accent. 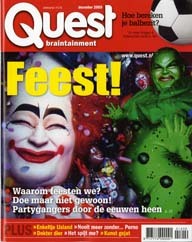 One of the biggest surprises that caught my attention was the second new magazine: Teen People. Yes, you read that right. A new magazine with an English name (remember Teen People magazine here in the United States) that deals exactly with what the now defunct American magazine: celebrities and more celebrities aimed at teenagers. The third new magazine called Séries fan capitalizes on the Twilight’s celebrities fame and names. In addition, it comes with 2010 Twilight “calendrier.” The amazing thing about all the aforementioned three magazines is the fact that they are all aimed to a group of people who the prophets of doom and gloom want us to believe they don’t read: teenagers. Well, my plane is getting ready to leave to my next stop: Beirut, Lebanon. I am happy with my loot from Paris, but I am happier that in few more hours the plane is going to lend in my birth country Lebanon. But, that will be the next segment of my ten-day-trip-around-the-magazine-world. Stay tuned. 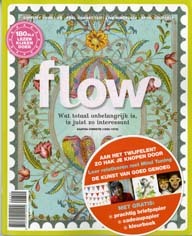 To read the first report about this magazine journey click here. I just returned to the United States from a ten-day-world-magazine-trip that took me to five countries in three continents: Europe, the Middle East and North America. My trip confirmed my doubts that people who made it their mission to predict the demise of the printed word have never been outside their little cocoons and thus have never visited the many newsstands of the world. My trip took me to Amsterdam, Paris, Beirut, Tripoli (Lebanon), Prague and back to Amsterdam and Memphis. The results three suit cases and more than 150 pounds of magazines. (Do not not even ask about the money I had to pay for the extra and excess luggage). In the next few days I will be writing about each of those cities and the magazines I have encountered during my visits. Today’s city is Amsterdam, The Netherlands. 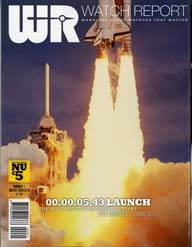 The four Dutch new magazines are: Reiz& magazine, JFK Style, Janine and WR Watch Report. 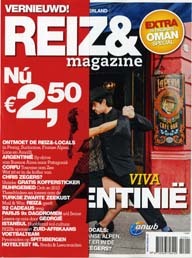 Reiz& magazine bills itself as the biggest journey in The Netherlands. A travel magazine that is published 11 times a year and offers its readers a wide variety of destinations including a special 16-page section on Oman. JFK Style, a spin off of JFK magazine, the Dutch magazine for men that is named after the late U.S. President John F. Kennedy. David Beckham graces the cover of the classically designed black and red cover of the launch issue of the magazine. Janine, the magazine named after Violinist Janine Jansen, tags itself as the “First and Only magazine of Style.” The latest of a host of celebrity-named magazines on the Dutch market, Janine promises to offer a different kind of content that utilizes a host of celebrity names on its cover and in its presentation. Last but not least is the WR Watch Review magazine with the tag line “magazine about watches that matter.” A showcase of watches in a presentation fit to a “king.” WR is NOT your everyday watch magazine. 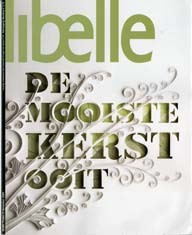 It offers a host of profiles, reviews and great photography starting from the double cover and all over its 178 pages. Stay tuned: next my magazine world at the Paris airport. 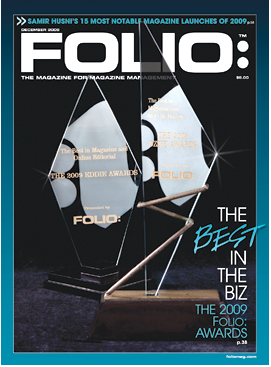 Read my entire interview with Vicki Wellington in the December issue of Folio magazine here. 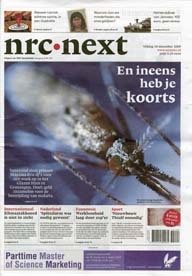 And I do not mean just the weather temperature, but rather the amount of magazines launched for the first time during the month of November 2009. 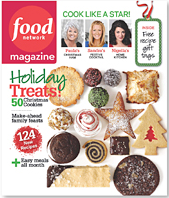 Only 43 new titles made it to the nation’s newsstands compared with 89 titles in November of 2008. A drop of almost 50% from the same period last year. There were 11 magazines launched last month with an intended regular frequency in 09. In November 08 there were 20 magazines with similar intended frequency. All the others were specials and one time shots. 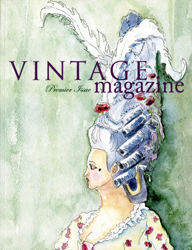 Some of the new magazines arriving for the first time to the nation’s newsstands show the quality only a print medium can only deliver such as the case with Vintage magazine. 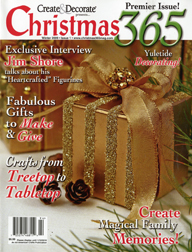 Another magazine takes an old topic such as Christmas and turns into a quarterly magazine celebrating (and aptly named) Christmas 365 days a year. Susie magazine, on the other hand, offers Christian teens an outlet to share their opinions and advice. 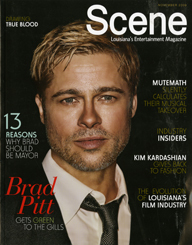 The area where it is starting to show some recovery and growth is in regional magazines such as the new Louisiana magazine Scene. 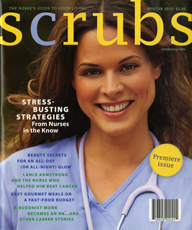 And last but not least, a new magazine celebrating the lifestyles and values of nurses called Scrubs. So how are we doing so far this year? Well, according to the early statistics we had four months where the launches this year were more than last, and seven months where 08 saw more launches than 09. However, we have a total of approximately 650 titles so far, very close to the 685 total of 2008. Therefore, Dec. is going to be the deal breaker whether this year will exceed the number of new launches from last year or not. So keep your fingers crossed, continue to celebrate the newborns arriving on the market place and never lose hope in an industry that knows it is in transition and is finding ways to deal with that. You make an accurate observation in “Must Have” vs. “Nice to Have” magazines: the print industry must transform to respond to the changing media landscape as consumers increasingly want and get their information from multiple sources. I must point out, however, that you challenge us to come up with a transition plan, one which we (Reader’s Digest) have made public (see Mediaweek, Folio, Delaney Report, Minonline, Mediapost, Crains, DM News), yet then point to elements of that transformation — such as going from 12 to 10 issues a year in order to transition content to digital options — as ills that will result in our demise. With all due respect (and I do mean that), you are talking out of both sides of your mouth. 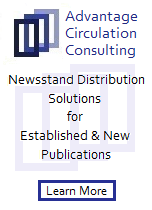 As the largest circulation magazine in the world with 50 editions in 22 languages generating hundreds of millions of dollars in revenues and healthy margins, I challenge your declaration that “none of the three magazines make much money from their subscribers.” We do. Lots of it. 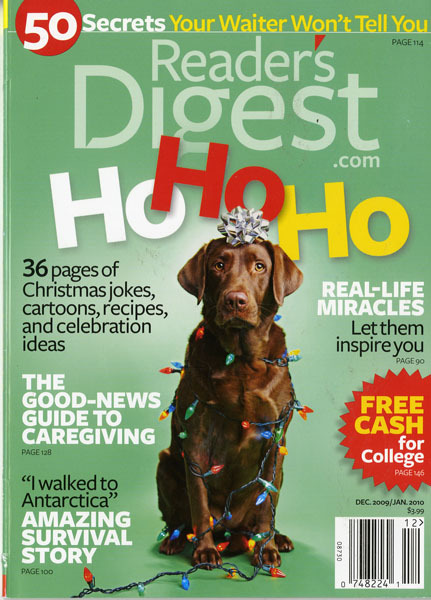 Eighty percent of Reader’s Digest’s revenues come from subscriptions, not advertising. That said, Reader’s Digest has significantly out-performed the advertising marketplace which ended the year collectively down 21% in ads vs. RD’s 7% decline. Seven percent down is the new up in this economy. And to your assertion that we “did not have too many ads in previous months,” Reader’s Digest had more ads in 2009 than 70% of the magazines measured by MIN. You also single out the three magazines as charging a dollar per issue for subscriptions. This is a standard intro offer across the vast majority of magazine publishers, and certainly not the model for the larger part of our (RD’s) sub file, so your point on this front is not well made. Certainly, the fact that consumers do not pay for broadcast or internet (or this very newsletter) does not mean they don’t value the content. Today’s bigger question is how all media will find new models that are not over-reliant on advertising revenues as their sole source, a process we have begun with our own transformation plan. And finally, to respond to your overall premise about “Must Have” vs. “Nice to Have” magazines: Reader’s Digest continues to have 5.5 million subscribers, one of the top 3 paid magazines in the country. 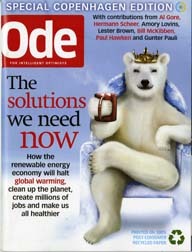 Last year the magazine won the American Society of Magazine Editor’s prestigious General Excellence award. 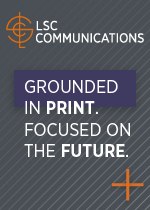 Our subscriber satisfaction and renewal rates are up, as readers focus on the back-to-basics values that have always been key to our appeal. Most important, our brand has long been much more than a magazine, with books, video and music collections that do well for us all over the world, now supplemented with a global website platform being rolled out in 40 countries. 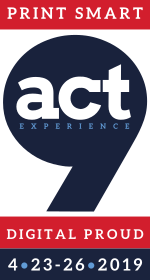 With our unique global reach and a culture of sharing content across borders, we have every expectation that we will continue to be a lucrative and relevant brand, and will make a successful transition to deliver content how, when and where our customers want it. 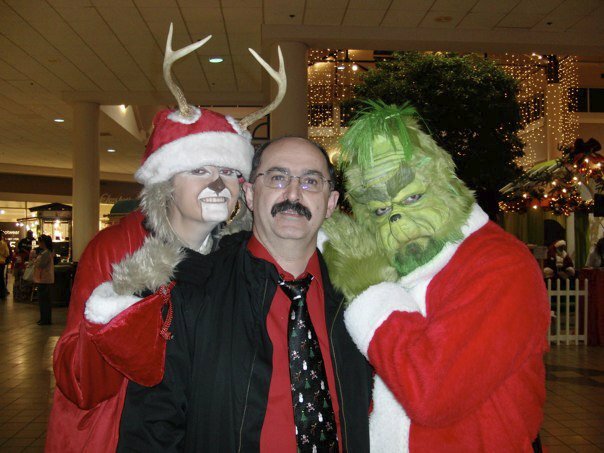 You are currently browsing the Mr. Magazine blog archives for December, 2009.